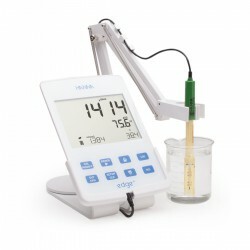 The HI5321 is an advanced research grade benchtop EC/TDS/Salinity/Resistivity meter that is comp letely customizable with a large color LCD, capacitive touch keys, and USB port for computer connectivity. The HI5321 is rich in features including 4 point calibration, autoranging, data logging, alarm limits, comprehensive GLP, and many more while retaining simplicity in use with both dedicated key for routine operation and virtual keys that guide the user through setup options. 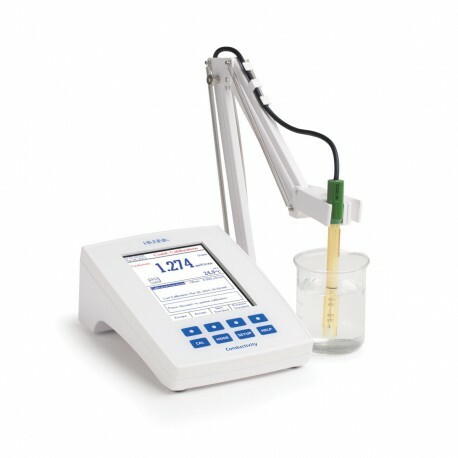 The HI5321 is an advanced research grade benchtop EC/TDS/Salinity/Resistivity meter that is completely customizable with a large color LCD, capacitive touch keys, and USB port for computer connectivity. The HI5321 is supplied with the HI76312 four-ring conductivity probe that operates over a wide range from 0.000 μS/cm to 1000.0 mS/cm*. The meter can be set to auto-ranging in which the meter chooses the appropriate conductivity range from seven ranges or fixed range in which the meter will only display reading in μS/cm or mS/cm. All readings are automatically compensated for temperature variations with a built in temperature sensor. The temperature correction coefficient is adjustable from 0.00 to 10.00%/ °C. The HI5321 can be calibrated up to four points with a choice of six pre-programmed conductivity standards or user defined custom standards. Resistivity, TDS, Practical Salinity (PSU) and Natural Seawater Scale are calibrated through conductivity. 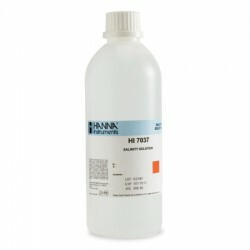 The % NaCl is calibrated to single point with the HI7037 salinity standard. The calibration data including date, time, and standards used, offset and cell factor can be accessed at any time along with the current measurement by selecting the Good Laboratory Practice (GLP) display option. For the measurement of high purity water used in pharmaceutical manufacturing, the HI5321 is programmed with the first two stages of the USP <645> method. Once a stage is met a report is generated and can be saved. Up to 200 reports can be stored and transferred to a Windows® compatible computer a USB cable and software (sold separately). 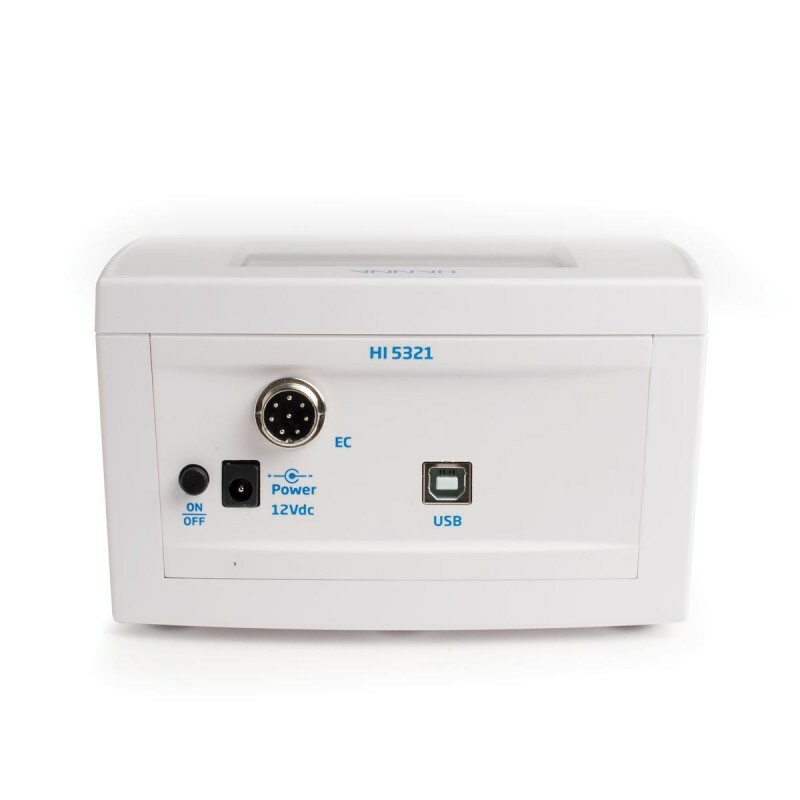 Highly Customizable User Interface – The user interface of the HI5321 allows the user to show measurements in various modes: basic measurement with or without GLP information, real-time graphing, and logging data. Calibration stability criteria can be adjusted from fast, moderate, and accurate. Programmable alarm limits can be set to inside or outside allowable limits. Color Graphic LCD – The HI5321 features a color graphic LCD with on-screen help, graphic, and custom color configurations. The display allows for real-time graphing and the use of virtual keys provide for an intuitive user interface. Capacitive Touch – The HI5321 features sensitive capacitive touch buttons for accurate keystrokes when navigating menus and screens. There are four dedicated keys that are used for routine operations including calibration and switching measurement modes and four virtual keys that change based upon use. The capacitive touch technology ensures the buttons never get clogged with sample residue. Four Ring Conductivity Probe – All readings are performed with the HI76312 four-ring conductivity probe that has a built in temperature sensor for automatic temperature correction. The four rings are made with platinum and the body of the electrode is made of Polyetherimide (PEI) plastic that is resistant to many harsh chemicals. The four-ring design allows for this probe to be used over a wide range of measurements. Choice of Calibration – Calibration can be set to automatic standard recognition or user entry along with a choice of single or multi-point. 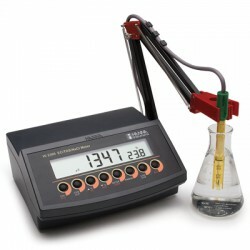 Calibration can be performed up to four points when multi-point is selected. GLP Data – HI5321 includes a GLP Feature thatallows users to view calibration data and calibration expiration information at the touch of a key. Calibration data include date, time, standards used for calibration. Data Logging – Three selectable logging modes are available on the HI5321: automatic, manual, and AutoHold logging. Automatic and manual logs up to 100 lots with 50,000 records max/lot, with up to 100,000 total data points. Automatic logging features the option to save data according to sampling period and interval. Data Transfer – Data can be transferred to a PC with USB cable and HI92000 software (both sold separately).